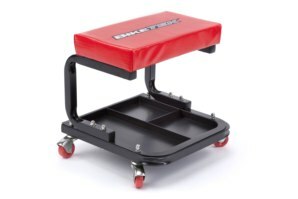 The Mobile Work Seat allows you to work on your bike in comfort, no more bending or sitting on the floor! Four rubber wheeled casters make swiveling around your bike comfortable and easy. With integral tray for storage of tools, parts & drinks! Note: This product is not manufactured by abba, therefor the guarantee on this product is the standard manufactures 1 year guarantee. Design of seat may change very slightly from image shown. Four 360 degree rubber castors. Integral tray for storage of tools and parts. Yes. The Work Seat is supplied flat packed and some basic assembly is needed. Does the Mobile Work Seat come with a guarantee? Got a Question about the abba Mobile Work Seat? If you would like to ask us a question about the abba Mobile Work Seat, simply fill in the form below and we will contact you within two working days. Want to tell a friend about the abba Mobile Work Seat? Alternatively fill in the form below and we will send an email on your behalf to your friend, with a link to this page all about the abba Mobile Work Seat.